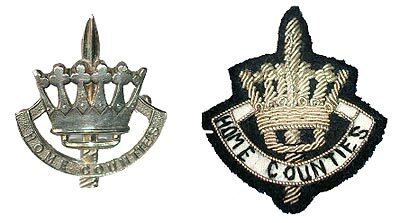 The Home Counties Brigade formally came into being on the 14th October 1959. It had previously been a Training Establishment since the end of the Second World War. The choice of name was not popular with the soldiers and they did not like the cap badge. The badge is a sword piercing a six pointed Saxon crown. The Saxon crown symbolised the common historical heritage of the Home Counties. Middlesex and Sussex were originally Saxon Territory, Kent was an early centre of Saxon power and at Kingston-upon -Thames lies the ancient coronation stone of the Saxons. 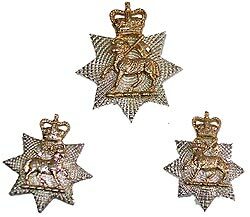 All regular ranks wore this cap badge from early 1960 but continued to wear their own shoulder titles and for the first time on battle-dress, their own collar badges. 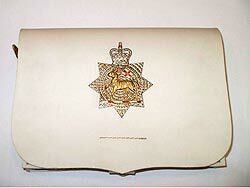 The badge became obsolete on the formation of The Queen's Regiment. The amalgamation necessitated the introduction of entirely new insignia. The design of the regimental badge, approved by the Amalgamation Committee, was the Garter Star in white metal surmounted by the Royal Crown in yellow metal (representing The East Surrey Regiment) with the Paschal Lamb standing on a bar in yellow metal (representing The Queen's Royal Regiment) superimposed as large as possible within the bases of the points of the Star. 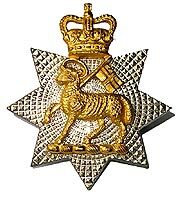 It should be noted that only the Territorial battalions wore the badge as a cap badge. The Regular battalion wore the Home Counties Brigade cap badge. The badge was worn by officers and other ranks of the Regiment as a collar badge.